Tunic has velcro and tie belt fastening. Jacket and tunic with attached belt and cravat. 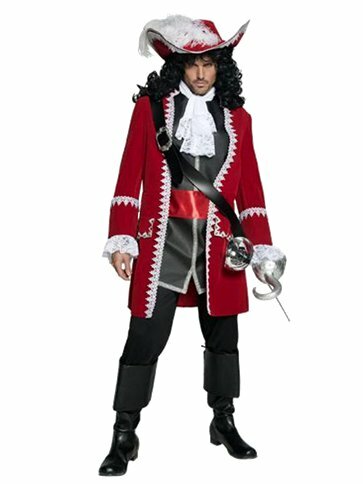 Our luxurious Pirate Captain costume is based on the well known Captain Hook character, this impressive three piece costume features a crimson red, velour jacket with glistening braid trim, oversized cuffs with delicate lace detail and faux pockets with silver jewel decoration. A leather look tunic with silver braid trim, attached red satin waist sash to front and tie belt to back for definition. The tunic has an elegant neck scarf with broad lace trim which fastens with velcro to back, everybody loves a good baddie and Captain Hook is one of the best.